Carolina Plantation is proud to announce the debut of "Charleston Gold", an authentic and deliciously aromatic offspring of the legendary heirloom grain, "Carolina Gold". Over the past decade, the collaborative efforts to restore and preserve Gold Seed Rice by the Carolina Gold Rice Foundation combined with the knowledge and research of scientist: Dr. Merle Shepard, Dr. Gurdev Khush, and Dr. Anna McClong who had a desire to improve its grain quality, yield, and taste has culminated in the birth of a new variety of Carolina-grown rice. 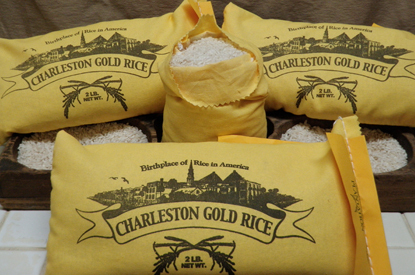 "Charleston Gold" ... named for the city where rice cultivation was born in America ... circa 1685.